November 21, 2016: See the comments section for a possible identity of Hannah Phelps Mitchell and family. Two nearly identical cabinet photographs by the I. S. Tapley studio of Lewiston, Maine, of a woman identified as Hannah Phelps Mitchell on one and Hannah Mitchell on the other. She might be wearing mourning garb. There were several woman in the Lewiston, Maine, area, and at some distance, by the married name of Hannah Mitchell. Just in case the names were not in the usual order, I checked all possibilities. There was a Hannah M. Phelps living at Lewiston, Maine, but she was Hannah Maria Phelps, daughter of John and Miranda Phelps. If you recognize Hannah from your family photographs and/or research, please leave a comment or contact me directly. "Milo Mitchell, a well-known farmer of the town of Mexico, Oxford County, was born August 28, 1863, in the house he now occupies, son of Jonathan and Hannah E (Phelps) Mitchell. His grandfather, Zebediah Mitchell, who was a native of Connecticut ... Jonathan Mitchell was born on the same farm. He married Hannah E Phelps, a native of Dixfield ... and they had four children, namely: Mary, the eldest, who married Parks Bardeen of this county; Ida, who is the wife of Willard Fog, of Wisconsin; Milo, the subject of this sketch; and Viola, now Mrs. Lincoln Reed, of Lewiston, Me. The mother died some time ago. 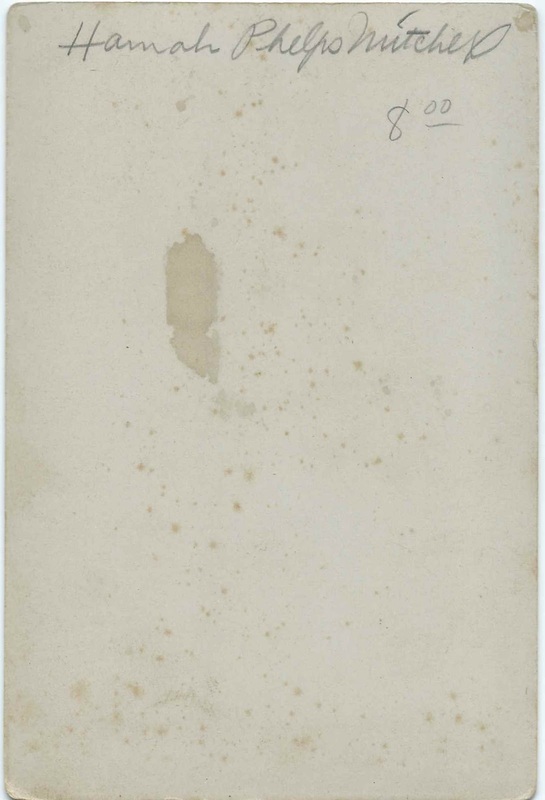 On June 12, 1893, he was united in marriage to Miss Crea [Ora] E Edwards, of the town of Roxbury, Me." 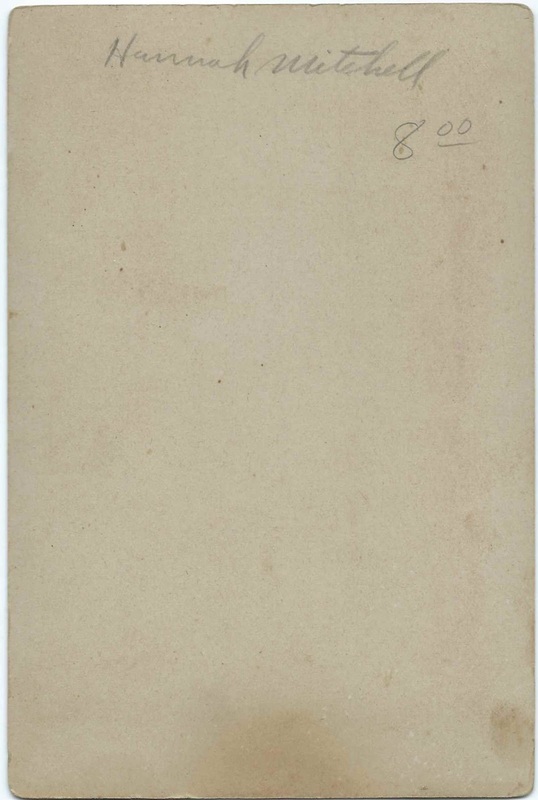 From page 588, Biographical review: this volume contains biographical sketches of leading citizens of Oxford and Franklin counties, Maine, (Biographical review publishing company, 1897 - Franklin County (Me.)). Note the marriage record for Milo and his wife says her name is Ora E Edwards, of Roxbury. Ora's father was listed as Paschal M Edmunds, but the record said it was the first marriage for both. He's living with them on a later census that I didn't include. Hannah Phelps Mitchell was born 30 November 1828 and died 27 December 1883. She is buried with her husband Jonathan in Old Mexico Corner, Roxbury Rd. findagrave calls it the Baptist Church Cemetery. Milo and Ora M Mitchell are on the 1900 census of Mexico Town, Oxford County with one child Merton, 7 months. Ora had only had 1 child at the time. Ora is head of the house in 1930 with three sons with her, Wilder M, 29, Raymond E, 28, and Lee E, 21. Milo Mitchell is buried in Farrington-Morton Cemetery with his wife and two sons: Lee Mitchell, born 1908 died 1932, and Raymond E Mitchell born 1901 died 1999 maybe. Ray's wife Lena E is also in the same plot, born 1904 died 1982 maybe. Wilder Merton Mitchell is on the 1940 census, in Mexico, with wife Elaine, age 27, no children. Merton died in 1970 and is buried in Dashon Cemetery, East Peru. The date of the record is 1984 and there is no date of death for his wife Elaine M (Robinson), who is listed on the plot record. I can't tell if Merton W (Wilder M) or his brother Lee had children. PS. Those Maine Cemetery collections are great. They must be new on familysearch, I haven't noticed them until a few weeks ago. I need to go through them for some of my wife's family. I just reread your article and noticed that you mentioned mourning garb. Hannah's husband Jonathan was born July 3, 1808 and died May 5, 1867. 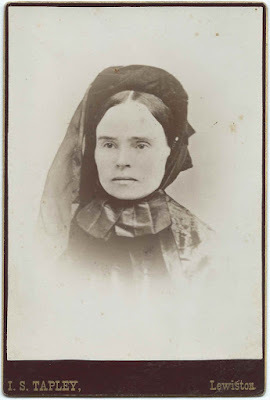 I'm thinking the photograph is from a later era than for Hannah to be mourning someone who died in 1867. In fact, I'm worried that the Hannah in the photo was born some time after 1828. Must research when cabinet cards came into wide use. Pam, I posted this last night but it didn't post. Tried again this morning and found out it was too long, so I will split it. Yes - seems I'm relying more and more on death and burial records, even though they can contain erroneous info from the informant. Her mourning bonnet is consistent with that of a widow in the 1860's. Honest. 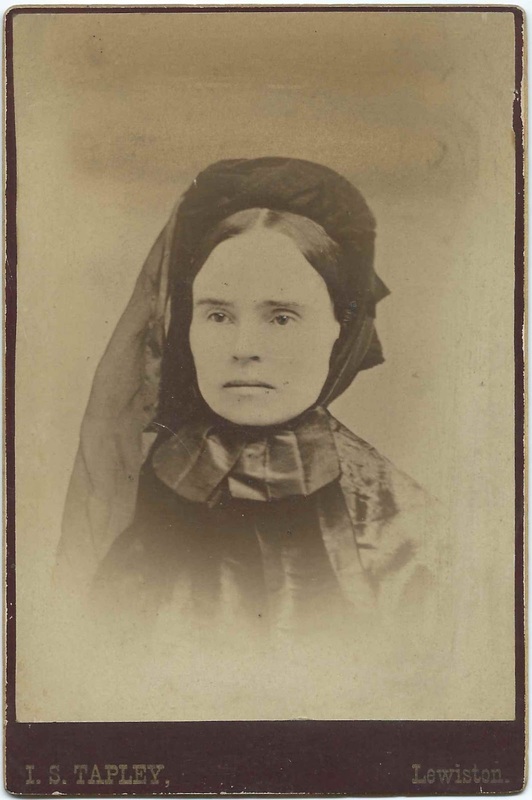 High poke, plain bonnet, and middle part to her hair- check out a Godey's of the era?